The majority of international packages arrive within 1-4 weeks. Less than 5% take longer than 4 weeks. Most orders are delivered within 1-4 weeks, however, some packages have been delayed by an additional 2-6 weeks (over 95% of our shipments arrive in less than 4 weeks). To avoid delays, be sure to provide an accurate shipping address, don’t forget any postal code, PO box numbers etc! A telephone number is also helpful to insure you are reachable by the mail service. We have flat worldwide shipping fee 5 USD to any country. Shipping is free for orders over 99 USD. All prices you see in our web store are final, no tax or shipping fee or any other payment will be added during checkout. No customs tax will have to be payed, you only have to pay the price you see. All orders are shipped as Registered Mail and delivered in the buyers country by receiver national postal service provider. Usually atleast one delivery to door is attempted, but if it fails, package will be sent to local post office and a notice with instructions are left to your mailbox. Worldwide Registered Mail shipping is tracked and delivered to any address in the world. Every order will be shipped with a unique shipment Registration Number, so that delivery status is traceable online. However please note that online tracking depends on buyer country postal service, not all countries support online tracking or it sometimes isn’t very accurate). This doesn’t affect the delivery process, most orders are delivered within 1-4 weeks. You can track the parcel’s way in Estonia and for some destination countries on this page. Just select your country from the choose countries tab, once the shipment has reached the destination country it will update status there. What if my tracking information is unavailable? If you receive a tracking status telling you that your tracking information is unavailable, it doesn’t mean that your item hasn’t been mailed. We ship orders daily (excl. holidays) within 48-72 hours from receiving the payment. Any order placed during weekend or a national holiday will usually be shipped on the next business day. 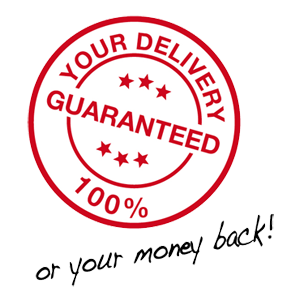 Please take to consideration, that all delivery times are estimated, and not guaranteed. Once your order is shipped, its delivery is out of our control. Please plan accordingly. If by any chance your order is not delivered in 45 days since the purchase because the items have gotten lost in postal system, we’ll issue a refund or resend the missing items.